A continuation of the report depicting the Imperial assault against Tau invaders of Dar Sai, the second moon of Sculptor IV. The Kroot charge the PDF troops in the jungle–just before they’re mowed down. The pace of battle picks up. In the north, the Kroot charge out of the woods, then run, and then attempt an assault charge. Alas, the Tau roll a 3 for its charge–and stop just a little more than an inch from the Imperial line. That is a disaster. Firing by ranks, the Imperials mow down nine Kroot–although the plucky aliens stand their ground. Already committed, the Piranhas move up to support the Kroot and drop their drones. The fire of both the drones and fusion cannon on the Piranhas open up on the Imperial line, but the barrage has little impact given the cover of said jungle. As the Piranhas break into the open, they come under attack from a Valkyrie sweeping overhead with missile batteries and beavy bolters raining down on the Tau armor. Alas, none of this has any effect on the xenos. In the center, the Tau firing line kills two troopers, but the Hammerhead misses its long-range shot at the Leman Russ Battle Tank. In the south, the Tau commander in the Crisis Suit uses his jetpack to get into position to fire upon the Sentinel in the building. But he misses. A Tau Crisis Suit and Stealth Suit fires but misses the Sentinels, which targets the Stealth Suit and destroys it. The Adeptus Mechanicus servitors continue their advance, and two fire warriors and two Kroot are killed by the servitors. The PDF attempt to ‘tank shock’ the Kroot and drive them back. To the north, having completed its attack run, the Valkyrie swings left and heads to the center of the battle. The few Kroot survivors of the devastating Imperial volley attempt to fire back. Another blistering volley comes from the woods, killing the remaining Kroot and the drones dropped by the Piranhas. The destruction of the Kroot earn the Imperials one VP for First Blood (eliminating a unit). In the center, the Imperials close on the Tau line–and kill only a single human. The tally should have been worse, but the Tau still cannot get their marker lights to work. What is wrong with the technology today? The Imperials fire by the ranks and kill three Tau drones and a fire warrior. The Chimera fires and misses. The Hammerhead has no shot and moves around the center to a better position. 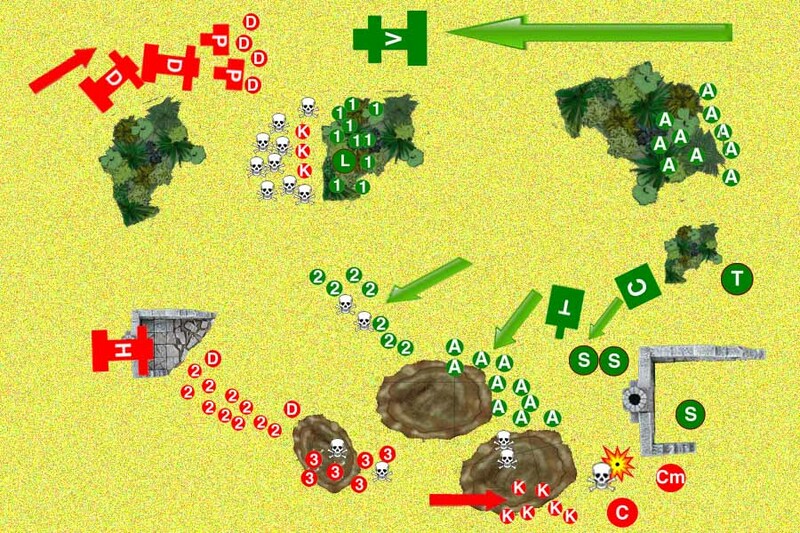 Then, the players forgetting that troops with rapid-fire weapons cannot shoot and charge, the Imperial line charges. In the subsequent melee, one Tau and one human arekilled. 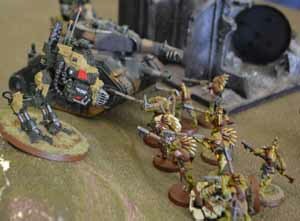 The Chimera and TechMarine advance up the center as a reserve. In the south, the Tau Crisis Suit jois d its commander at the ruins’ edge and, between them, they manage to destroy the Sentinel in the building. The Leman Russ attempts to “tank shock” the Kroot who move out of the way. Most other fire goes wide. The Sentinels open up on the Crisis Suits but miss. The Servitors advance, their fire killing two fire warriors. Note that one squad of Adeptus Mechanicus troops has spent the entire battle in the northeast woods, a reserve to deal with any threat to the two objectives already under Imperial control. In the north, the Piranhas veers away from the crumbled attack on the jungle and heads towards the center, while the Devilfish unload their fire warriors in preparation for a second attempt to rush the jungle position. It is too late, but the Tau commander finally understands the game mechanics for unloading his fire warriors—behind the Devilfish to protect the infantry from fire. Too bad the drones aregone. What a difference it would have made if the Kroot had charged out of the jungle this turn, rather than earlier. In the center, one Tau and one PDF trooper are killed in the ongoing melee. In the south, one Adeptus Mechanicus Servitor is killed by a Kroot, whose tribe is forced to move as the Leman Russ attempts a second “tank shock” that fails. The Servitors continue to advance and kill a fire warrior, while the Hammerhead moves up on the hill to fire on the flanking Imperial armor. Facing a tank and two Sentinels, the Crisis Suits leaped into the cover of the nearby building, then realize they could have used their jet packs to leap over the tanks and target their rear armor. A devastating tactical mistake by the Tau, and another sign of how the players still have much to learn about their armies. 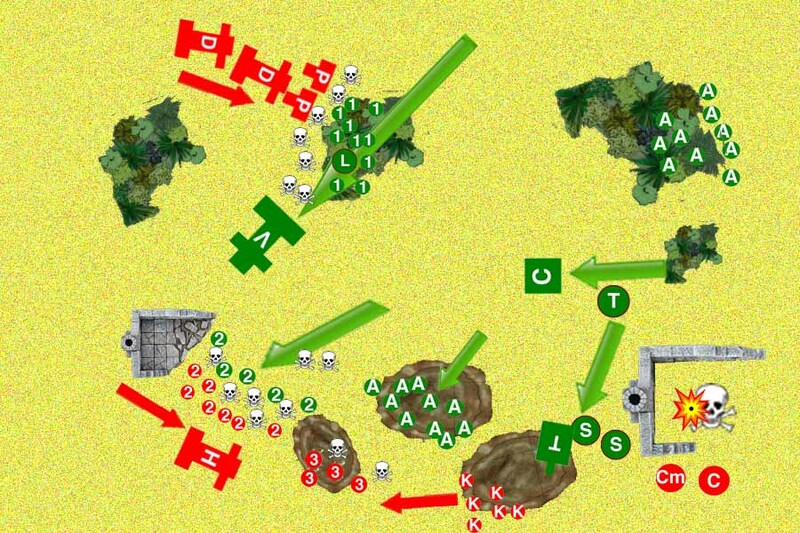 In the north, an Imperial lascannon hidden in the jungle targets a Piranha in the flank and blows it up. To the south, the Tau Commander, hiding in the building and contemplating his options, realized the battle was lost. Rather than take on the Imperial armor, he sits out the turn and orders a withdrawal. The battle is over. VICTORY TO THE IMPERIALS: In addition to causing more casualties, the Imperials are up one VP for First Blood. In theory, the Crisis Suits could have seized one objective in the Imperial zone, while the Imperials would have seized one (or possibly two) objectives if the game had continued. FromtheGM: It’s clear that both players still have much to learn about the armies they command. The Tau commander failed to coordinate his attack in the north. If the Devilfish had dropped its squad of fire warriors earlier–and then the Kroot had come out–then the Imperials would have been overwhelmed. That the Tau commander in the south forgot about his jet pack’s abilities also was painful to see. With the fall of Medea III to xeno control, it has been long anticipated that the Tau would continue their infiltration tactics on a nearby world. Rumors of a xeno presence on Dar Sai have been recorded for several months, but most focused on the presence of a small diplomatic team. There was no evidence to suggest that a larger military force was present. The latest encounter was the result of a preventative sweep of the Hanui Valley, where many of the rumors have been centered, with the intent of displaying an Imperial presence and offer the resources to capture any small xeno presence. It is to the credit of the PDF commander that, upon discovering the Tau military presence, he moved aggressively to suppress it. Under the best of conditions, the PDF would immediately give chase to the retreating xenos. But they have fallen back into the unsettled lands to the west of the valley—a heavily forested area with no roads and an extensive forest canopy that will negate the PDF air arm. For this reason, a build-up of troops and supplies will be necessary before an extended deployment—let alone an advance against a well-armed enemy—can be contemplated. 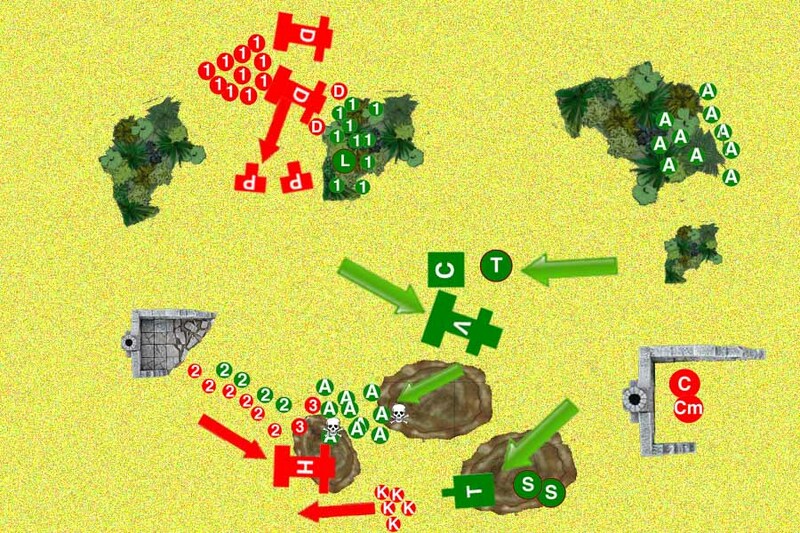 Read part 1 of this battle report.